I believe children's ministry is one of the most important ministries in the church. But the truth is, in many churches it's way down the list when it comes to visibility, budget, staffing, volunteers, building space and recognition. It is critical that churches understand how important children's ministry is...not only for children, but for the entire church. That's why we are bringing a live webinar to you entitled "Making Children's Ministry a Priority in Your Church." 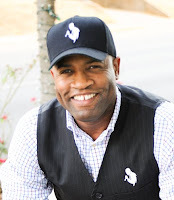 I am excited to have my friend and children's ministry champion, Ricardo Miller, joining me as a speaker for this webinar. He is one of the nation's leading and most influential voices in children's ministry and leadership development. He has journeyed throughout the United States, the Caribbean and Central America evangelizing children, training parents and equipping children's ministry leaders. 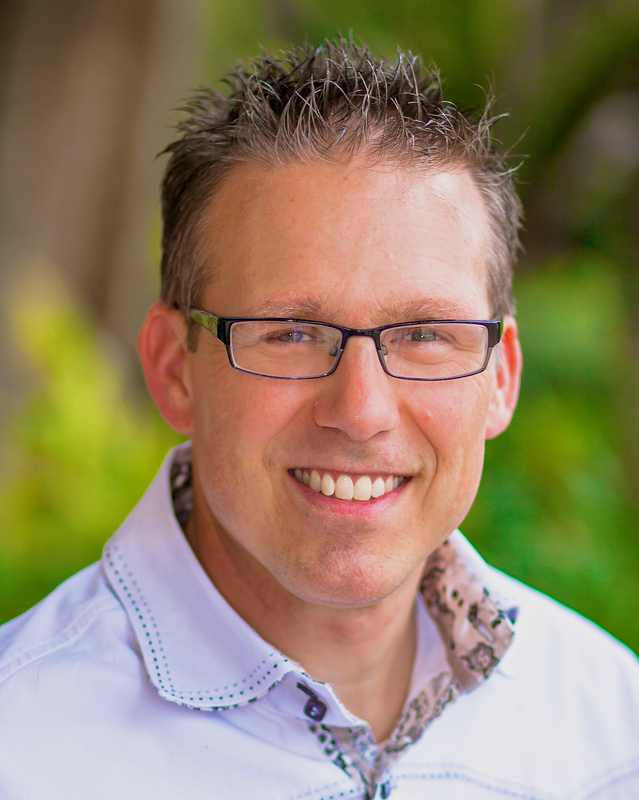 Recognized as one of the top 20 most influential leaders in children's ministry, Ricardo is a trendsetter, making waves in reaching the next generation. The webinar will be on Thursday evening, April 6th from 8:00-9:30 pm EST. Session 1 - I will be talking with you about "Why Children's Ministry Must Be a Priority in Churches." I'll give you a solid, Biblical foundation for why children's ministry is crucial for any church that wants to reach its community. You'll walk away with the tools you need to share why your church should make children's ministry a priority. I have personally seen the truths I will share work in churches. In the most recent children's ministry I led, it helped the church double in size. 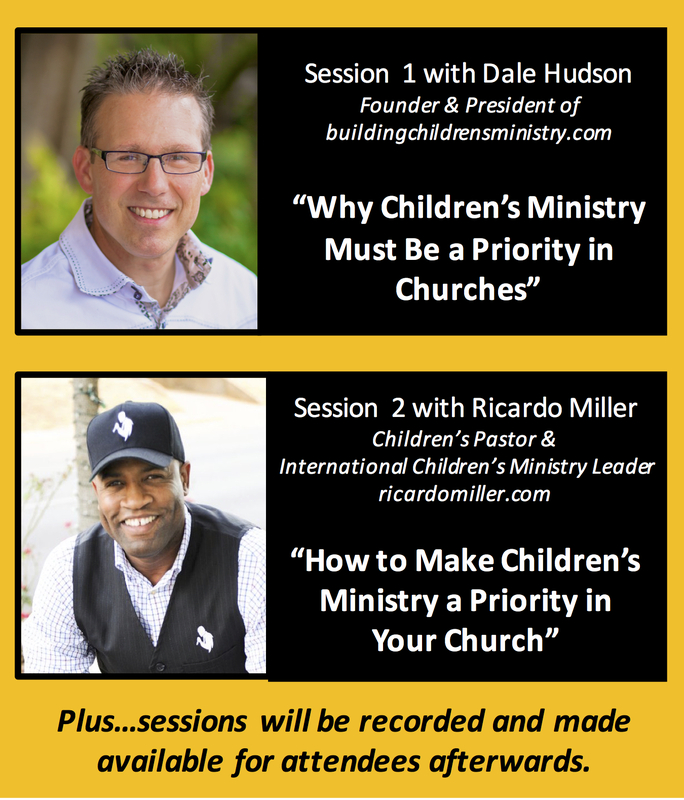 Session 2 - Ricardo will be talking with you about "How to Make Children's Ministry a Priority at Your Church." He will share practical steps you can take to make children's ministry a big deal at your church. Ricardo lives this each week as a children's pastor at his church where he has seen the children's ministry become a high priority. Both sessions will feature live Q & A so you can interact with us and the other attendees to get answers to your specific questions. One important thing I also want to mention. We will be recording the webinar and you will be able to access it and even download it afterwards. I believe this will be extremely helpful for many people who want to share the teaching with their lead pastor or other leaders/decision makers in their church. Many times a children's director sees the importance of children's ministry, but then struggles to get the Pastor or other decision makers in the church to understand. 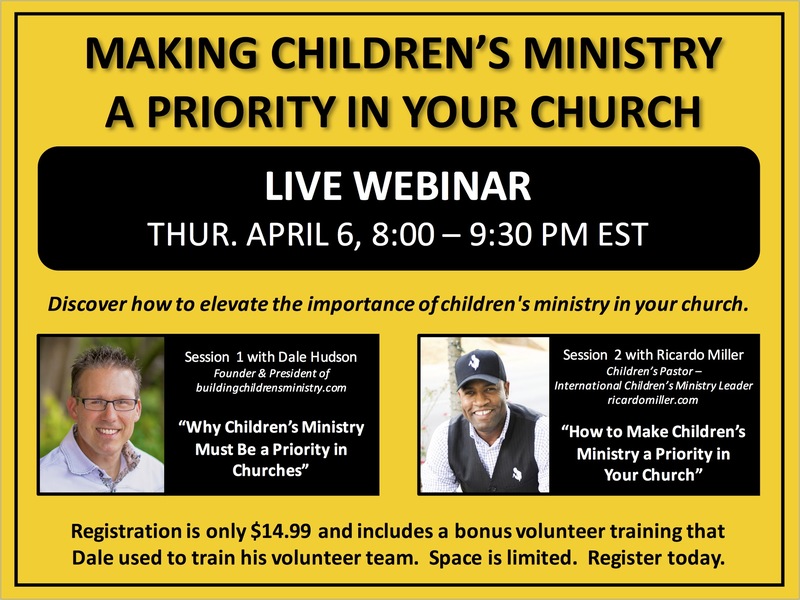 This webinar will be great to pass along to other leaders in your church to help them see the importance of children's ministry as well. In all my years of serving as a children's pastor, I was always looking for articles, videos, podcasts, etc. that I could pass along to my leaders to help them understand why children's ministry must be a priority. I would have loved to have had a session like this to share with them. The registration for this webinar is only $14.99. As an added bonus, I will be giving a ready-to-go volunteer training to everyone who registers. This is a training I used to train my volunteers and includes the teaching notes, handouts, media files, etc. You can register for the webinar at this link. Once you're registered, we will send you the link and pass code for the webinar. Space is limited, so register as soon as possible. Below is more information. Join us and let's make children's ministry a priority! I just registered ( I think) for the webinar for tomorrow night 8-9:30pm regarding the Children's Ministry. I have a receipt for $14.99. However I do not see the link I am suppose to log in where is it? Will an email be sent to me???? Hi Regina, glad you are able to join us. Yes, you will receive a confirmation email today with a link to the webinar. You will also receive an email later today with the teaching notes, etc. Let us know if we can be of any more help. Blessings. Hi -,thanks for letting me know- did you register under the name Praise Assembly or a different name? Couldn't find a registration for praise assembly. Feel free to email me at daleh@buildingchildrensministry.com and we'll assist you.